You don't need me to tell you that Anthem, BioWare's lambasted looter shooter that didn't so much as launch in February as it did faceplant straight into the recesses of mediocrity, is struggling to stay afloat right now. BioWare hasn't revealed any official stats about the game's current userbase, though it did sell impressively in its first week, but a new player-run survey conducted through Reddit provides a clearer, yet somewhat disconcerting snapshot of Anthem's health two months after release. 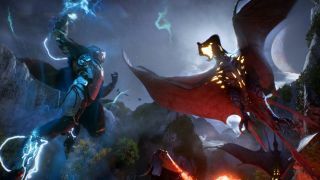 The survey, conducted by a fellow Anthem player called SyntaxTheGr8, received over 1000 responses, and a summary of the questions and answers it contained can be found here. If you don't have time to run through the whole thing, though, here are the most cringe-worthy highlights. The survey's results found that of the data pool of Anthem players who participated in the survey, 50% have encountered "many" bugs in their playthrough so far, 56% give BioWare's current loot system a rating of 1 out of 5, and 53% have already quit the game for good. In better news, only [squints] 36% of players think the future of Anthem is "not looking good at all", while the rest are merely "concerned"... wait, that's still bad, isn't it? The survey also asked people for their written responses to the question "If you were to change one thing in Anthem, what would it be? ", the answers to which were then used to generate a word cloud and, uh, yeah... it paints a pretty clear picture of how people currently feel about BioWare's latest. Find out what other new games of 2019 are on the way this year, or see what we thought of Anthem back at launch by watching our 60 second review below.